Bringing continuity to patient care. Developed by medical practitioners who saw the need for more efficiency and better communication, the Rati-Fi® system can help you mitigate risk, increase revenue, and improve patient outcomes. 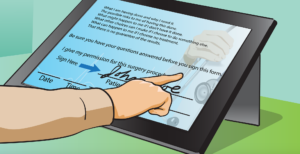 Rati-Fi® improves pre- and post-care education by using high-quality medical animations to explain treatment options, a survey to test for comprehension, and a video-based informed consent process to capture the doctor-patient conversation – storing a video of the consultation and PDF of the signed consent file securely in the cloud. Complexity is the enemy when helping patient’s make decisions about their medical care. Rati-Fi® simplifies the conversation for both physician and patient – ensuring clear communication, full comprehension and truly informed consent. Learn more about how Rati-Fi® can help improve your medical practice. Rati-Fi® educates patients and their caregivers using videos from the PreOp® Surgery Video Library and PreOp® Discharge series. Featuring professional medical illustrations, informative animations, and plain language, these videos describe complex medical procedures in simplified terms that patients can more easily understand. Rati-Fi® offers access to a range of treatment topics in all major specialty areas (please see FAQ for more info). Click on any of the areas of expertise below to view a sample video from the series. Expert content that earns respect. The videos that Rati-Fi® includes in its mHealth platform are relied on for their accurate and informative content – used to support clinical training at teaching hospitals and provide patient education in other hospitals nationwide. Request your Rati-Fi® demo today. Discover how this mHealth solution can help improve continuity of patient care for your practice, ASC or healthcare system. Through our partnership with JASE Health’s EHR experts, we can provide seamless integration with your organization’s EHR by embedding our solution within your existing EHR clinical workflow. Our developers manage the process for you, so you’re not required to free up staff to get Rati-Fi® up and running.